I’m a recruiter and I’ve made a ton of mistakes throughout my career. 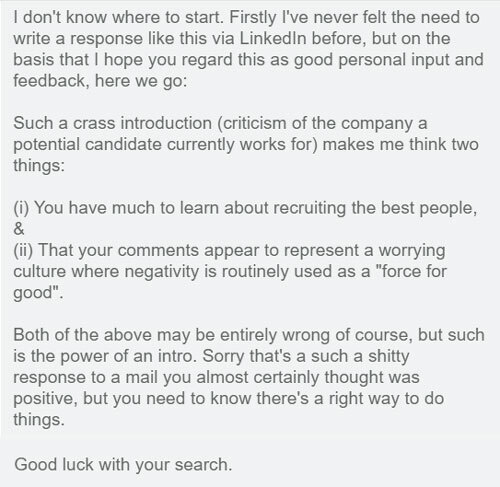 And, one thing I learned right at the beginning of my career is that most people dislike recruiters. In fact, most people really think negatively of recruiters and will quite happily expose them when they have made errors of judgement (thankfully the person below didn’t do that). Another thing I’ve learned is that mistakes in life and work can be tolerated, but only if you learn from them quickly and use that newfound knowledge to your advantage. I was recently asked, “what was the biggest mistake you’ve made as a recruiter?” I started thinking. I had a ton of examples, but one in particular sticks out in my mind like a sore thumb and I've reflected on it time and again. He was right! What kind of introduction was that?! Especially when I completely overlooked that this was a co-founder of the business and what must have been a particularly difficult time in his career at that moment. I can just imagine the thought that was going through my head at the time, “THE COMPANY IS GOING DOWN! QUICKLY MESSAGE EVERYONE AS I’M SURE THEY’LL ALL WANT TO LEAVE”. That thought isn’t necessarily a bad one though - being able to act quickly with a valuable piece of insight is often fruitful when recruiting. Perhaps even that exact same message may have received a positive response from someone else in the business who had perhaps been recently let go and felt resentment. But upon your introduction you don’t always know the full situation and you certainly don’t know the person well enough to assume how they feel. Consideration and empathy are never underestimated. Many people invest time, money and emotion into their business. Do your research before making an introduction. So, how would I approach the scenario now? I would start off with condolences for their situation, as for a founder a startup can be their life's work and one of their proudest achievements. When it doesn’t work out, it can be heart breaking. It wouldn’t be hard for me to find some of the achievements of that startup and specifics about why their profile would make them a potential fit for the new opportunity; introductions should always be personalised. And ending the message, I’d acknowledge that it may be a difficult time and that a new opportunity may not be right for them for some time, but when that time comes I’d be glad to help in any way I could. As I said before, “mistakes in life and work can be tolerated, but only if you learn from them quickly and use that newfound knowledge to your advantage.” This was embarrassing at the time, but I’ve learned from it and become a better recruiter because of it. 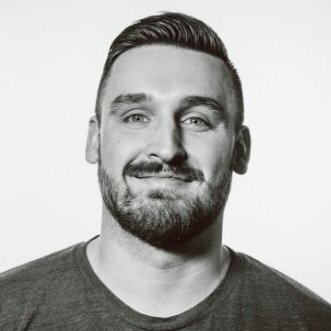 After spending many years in agency recruitment, Joe Burridge is now an in-house Tech Recruiter for Hudl based in London, UK. He is also the creator of Joe Blogs and was identified as a LinkedIn Power Profile in Human Resources for 2015.